Super Hi-Vision is the biggest video system in the world. At 8K resolution it has 16 times the detail of today’s high definition television. On giant screens it is a stunning experience – and now NHK have developed a system that puts 8K anywhere. NHK’s Super Hi-Vision system is being demonstrated in the Middle East for the first time between 20 – 22 January 2015 at IBC Content Everywhere MENA, a three day exhibition and conference which will bring together the leaders from the converging world of media, telecoms and IT. In addition to this being the first time that 8K will be demonstrated in the MENA region, this will also be the first time that 8K is seen displayed on portable screen outside Japan. 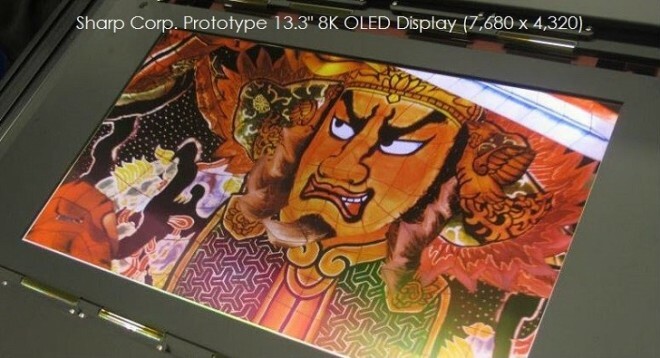 The 13.3 inch OLED screen has been developed by Semiconductor Energy Laboratory, and it will be in action alongside some very much larger displays, showing the flexibility and immersive power of high resolution video. This incredible, handheld 8K screen uses a high resolution with 664ppi, going far beyond visual limitations, creating a picture that is better than high quality printing. This means that the OLED displays videos in higher quality than photographs, producing an image that appeals to the viewer’s senses. Despite its small 13.3 inch display, the image is so sharp that it provides a close-up three dimensional effect. Whilst still in prototype phase, this development proves that 8K is not only for the big screen, but could also be used to provide a truly immersive experience on personal devices such as tables or notebooks. NHK has been responsible for some of the most important developments in television, including the plasma screen, HD and satellite television. Super Hi-Vision is its biggest technical challenge yet, and it aims to broadcast it to homes in Japan by 2018. Demonstration material to be shown at IBC Content Everywhere includes remarkable coverage of games at the 2014 FIFA World Cup in Brazil. Also on the programme will be video created for art galleries and museums in Japan, showing how the system is ideal for public spaces and events. Visit NHK at stand number G10. IBC Content Everywhere MENA will be held in the Madinat Jumeirah, in Dubai, 20 – 22 January 2015.